This weekend I got to welcome my lifelong friend Thompson's baby boy, Caden Thomas, into the world. He arrived on Friday afternoon and is just the sweetest, most precious little guy! I was at the hospital on Friday but didn't get to hold him but for just a minute, so on Saturday my mom and I went back and spent a little more time "ooh-ing and aah-ing" over him. Thompson looks AMAZING and Brent is one proud papa. I was so happy to be able to share such a special time in the life of their family. Congratulations Camp Family of 3! Are we cute or what?! My family was planning a trip to Disneyland with another family that had a son my brother's age, but NO girls. I didn't think it was very fair for my brother to get to have a friend and me not to...especially since my 8th birthday was going to be during the trip, so I got to bring Kristin along. 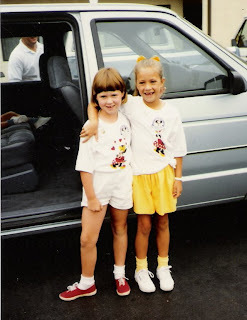 We had matching outfits for just about every day of the week...including these lovely Minnie Mouse shirts and some tie-dyed outfits that we made ourselves. Those same tie-dyed outfits got wet on the water rides and dripped red and purple dye down our legs. I can remember my mom drying them out for us under the hand dryers in the bathrooms while we waited in the stall to get our clothes back. I truly think that we missed our calling in life to be fashion designers...I think we were pretty inventive to create those outfits out of bandanas! There are some more "questionable" wardrobe choices that we have pictures of, but I won't go there. We've changed a little, huh? You look so good. I am happy that thompson finally had her little man! He is a cutie pie too! You did look like a pro holding him.HMMMMM. We miss you so much! and thanks for FINALLY updating your blog! love ya lady! Ha Ha!! The pics of you and Kristin are tooooo funny! 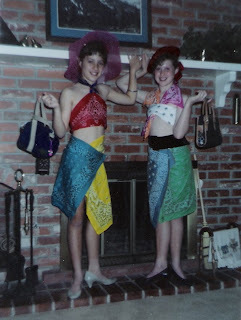 I was probably jealous of those outfits! It was so fun to see you this weekend. I'm excited to see you at the wedding! I hope those pictures of us in our Cowboy outfits, greasy hair, and braces never show up on this blog. ;) Oh wait, those were just my braces. What fun pictures! I just love the bandana outfits. Where can I get one? Hope to see you on Saturday. Back in the day, y'all should have started some kind of bandana multiples (isn't that what they were called?) business. You could have made a fortune! I love them! You are hilarious. It was great to see you. Thanks so much for coming in and I hope to see you guys at the wedding.